It began as a piano composition for four hands; Bowie thought it didn’t work and put it in the discard pile. When Bowie went off to Paris, however, Eno, left on his own at Château d’Hérouville, revived “Art Decade” and added layers of synthesizers to it (primarily ARPs, a Minimoog and his “suitcase” EMS Synthi). Upon his return, Bowie took Eno’s tapes and added further layers to them—the percussion, for example, was done on Bowie’s Chamberlin. The cello that underscores the bassline (particularly from 1:05 to 1:25) was played by Hansa Studios engineer Eduard Meyer. That said, “Art Decade” isn’t that radical. After its brief (12-second) percussive opening, it consists of two distinct, alternating sections (much like “A New Career In a New Town”). There’s a nine-bar (or if you’d like, 36-metronome-click) main theme, a slow traversing from E flat to D major and back to Eb and E major. The main melody is a descending four-note line (sometimes with all notes flatted) that’s eventually severed: it’s reduced to a two-note phrase, then just a single whole note. Repetitions of this decayed melody (Bowie’s title possibly puns on this) make up the piece’s other main section—alternating patterns of two stepwise descending notes and two notes rising a half-step. Eno had spent late summer 1976 at Harmonia’s studio in Forst, Germany (Harmonia was a super-group of sorts, a collaboration of Michael Rother (Neu!) and Dieter Moebius and Hans-Joachim Roedelius (Cluster)). They had jammed, experimented, run through a few songs, and Eno had left saying he would return soon to make a proper record. Instead Eno went to France to work with Bowie on Low. The tapes from the Eno/Harmonia sessions, which didn’t surface until 1997, show some similarities to Eno’s subsequent work with Bowie: the interlocking, repeating patterns of “By the Riverside,” for example. Yet many of the Harmonia/Eno tracks like “Aubade,” “Welcome” and “Sometimes In Autumn” have a much freer sense of tempo and construction—the pieces progress, sometimes rhythmically, sometimes melodically, in a logical but unpredictable design; they have the lightness of indulged thoughts. “Art Decade,” by contrast, feels confined, even claustrophobic; its beauties are funereal, a brief procession through ruins. Bowie called “Art Decade” a thematic counterpart to “Subterraneans,” with the former an alleged musical portrait of West Berlin in the shadow of the Wall. And in turn “Art Decade”‘s two sections could stand for the severed halves of Berlin: the melancholy West set against the stasis of the East, the decay of Romanticism met by the austere promise of Minimalism (Eno and Bowie were familiar with the Minimalists, having both attended a performance of Philip Glass’ Music With Changing Parts in London in 1971). Recorded September 1976 at Château d’Hérouville, overdubs at Hansa, Berlin. Played on the 1978 tour, generally as a palate cleanser before the closer “Station to Station” (a version from Philadelphia is on Stage) and in 2002. A likely influence on Eric Serra’s soundtrack work, particularly 1989’s Le Grand Bleu. *Eno is credited as co-composer of “Art Decade” on the 1978 live record Stage, while Bowie is sole composer on the BMI copyright. 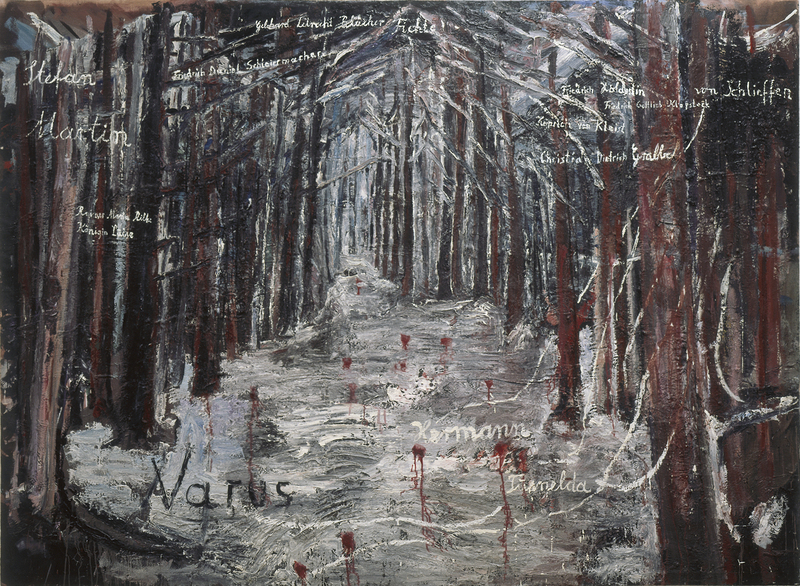 Top: Anselm Kiefer, Varus, 1976. This entry was posted on Wednesday, March 9th, 2011 at 9:16 am and is filed under Low: 1977. You can follow any responses to this entry through the RSS 2.0 feed. Both comments and pings are currently closed. Well you learn something new every day as I’d never noticed the variable writing credits before.I’d also not heard the Eno/ Harmonia material before so must look into that some more. I always felt that Art Decade took a smidgen of Kraftwerk’s Radioland as a minor influence in places and built upon it. It is indeed strange that Eno’s technique at this time was to integrate randomness into the proceedings, and yet all the pieces on the second side of Low end up quite structured. In fact they’re very different from the instrumentals on “Heroes”, which seem a lot more fluid and improvised. I’d be interested to know whether Eno had more to do with the “Heroes” instrumentals, or less. As with every track on LOW- I love this track. However a comment that some critic once made about the “elephant trumpeting” sound in Art Decade has always stayed with me – he said that it was rank. He actually meant it as a compliment. It’s always coloured my listening experience…. I failed to comment on this track so sorry as it is one of my favourites on Low it is in my opinion quite accessable though it is bleak Its title is great. A great piece of commentary well done. Have searched for hours online to verify that Art Decade is, in fact, credited to both Bowie and Eno – and not just Bowie – on any legit vinyl or CD pressing. Words: yes. Picture proof: no. Any leads, anyone? Eno is credited on the 2005 EMI remaster of “Stage.” he’s not credited on the orig. vinyl or the Ryko version. col1234, thank-you for the image link to your verification via said CD. I will be adding that correction to my digital listening catalogue – along with Richard Rodgers (sic: Rogers) credit for the “Bewitched” (orig & full: “Bewitched, Bothered and Bewildered”) part on the “Future Legend” intro to first UK pressings of Bowie’s “Diamond Dogs” LP. The “Bewitched” part credit was removed from subsequent pressings to date, both on LP and CD, as far as I know.